Brain Injury: I was a pedestrian and got hit by a drunk driver while walking to the store. Explanation of Mask: The red, white and blue is for the United States and England. The red, white and green is for Hungary and Whales, which is the color of my family heritage. The eyes are for computers. The Marine sticker represents me, as I am a Marine Veteran. Prior to my injury, I was active duty Marine Corp member and I was an electronics specialist. The Radar Screen and IBM computer represent this as well. The crosshair is for being a rifleman, as Marines are riflemen. I am a Marine for life – Semper Fi. Explanation of Mask: Before the accident, I remember the beautiful sky and stars. The moon and stars represent the last thing that I saw before my accident. The pick hearts represent love, and the cross represents faith. One of God’s greatest gifts is love, and his love has given me rays of hope for a brighter future. That is the ray. The interloped hearts on the bottom represent that my words come from love. The right eye is closed because I am not ready for both eyes to be open. It is my fear. The left eye is partially open to represent that I am waking up to face reality. The tears represent the loss of my career, people, and part of life. The X on the nose represents my loss of smell. Brain Injury: Multiple brain injuries from abusive foster care, car accidents, and adventure. Explanation of Mask: I am determined! 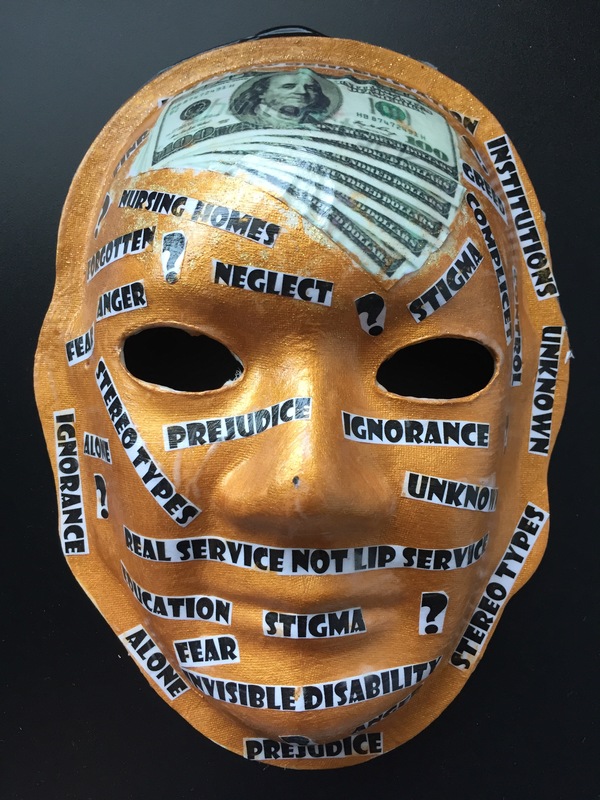 Although the more I grew up, I knew that I was different and I had to mask my disabilities. More and more I was strong. I survived and became successful! Only to realize why I was different just two years ago, here at the Brain Injury meetings. I now have more hope to know why I am different. With my new pursuit into medical care, another or second chance and a whole new life! Look out Albuquerque! Brain Injury: Motorcycle accident resulting in a TBI at age 18 years. 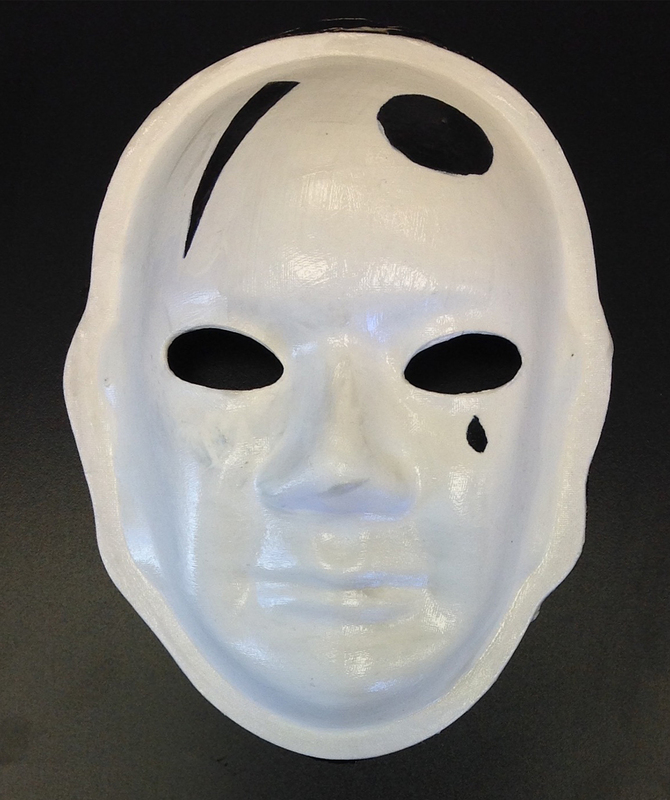 Explanation of Mask: The primary color of Gary’s mask is black, his favorite color. Within it is displayed, “Never Give Up,” his life motto since his injury. The mountain represents his perseverance he has exhibited along his journey as he continues every day to move mountains, even if it is one granule of sand at a time. The heart in his eyes show he sees with his head. Although Gary cannot speak, he tells his love story with the most amazing strength and courage and lives his everyday life with unending faith. Gary has learned family is the center and most important part of his life. He has a smile that will melt even the coldest of hearts, and he lives every day to its fullest. Brain Injury: I fell off a loading dock. 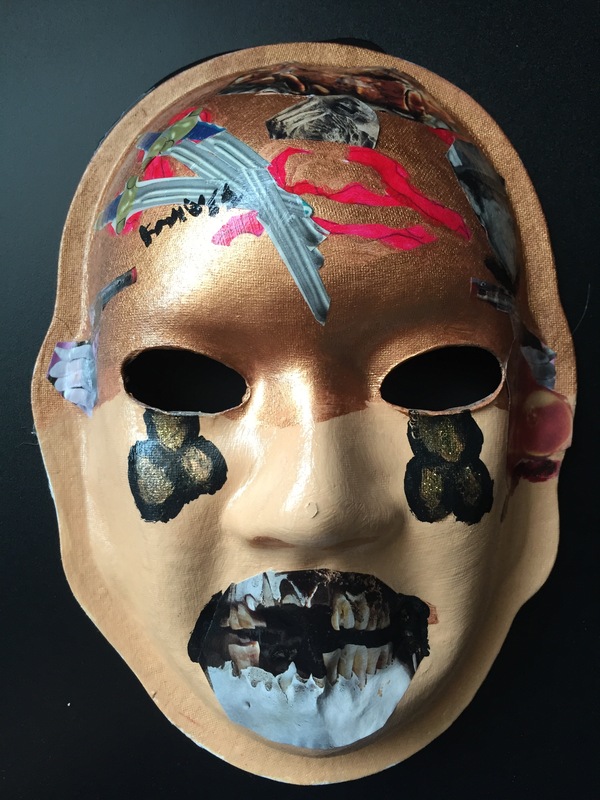 Explanation of Mask: The title of my mask is “wet and dry.” I had a fall, and everyday it is either I’m out on a limb, or I am so involved that I cannot keep up. The dry is a day that I am okay, and on the days that are overwhelming I am wet and cognitively challenged. Brain Injury: Right before my 4th birthday party, I fell and landed head first on the edge of a rock step. At age 30 I developed an illness that caused inflammation of the blood vessels in my brain, restricting the oxygen-bearing blood flow. 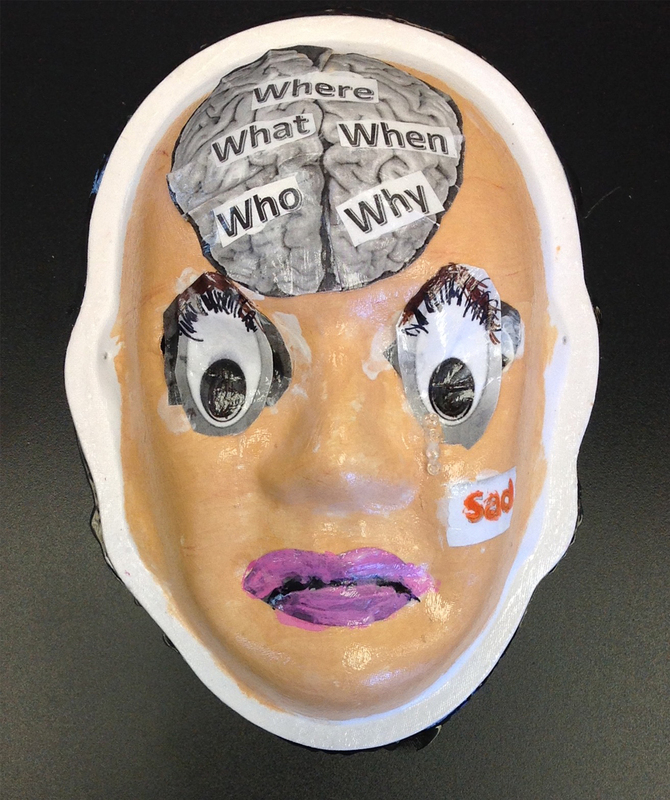 Explanation of Mask: My first brain injury was on my fourth birthday. My learning problems made me feel like a square peg in a round hole. In high school, I found that I was good at digital electronics as used in computers. From age 19-22 years, I worked for a prestigious pipe organ company. At age 22, I got married and joined the Air Force and repaired computers at NORAD inside the mountain in Colorado. At 40, I was successful in the computer field, until illness “smoked” my brain. At age 53, I rode my bike 850 miles to reconcile with my daughter. She called the police on me when I arrived. Once very close, my family portrait now includes my ex-wife, my ex-son, and my ex-daughter. At 53, I met Sherry May. We have different brain injuries and help each other. We have become one, and I never knew that life could be so wonderful. At 60 years young, I am still that square peg in a round hole, but I am polished now and comfortable where I am at. Brain Injury: In 1979, I was a driver in a head-on motor vehicle accident. I had a crushed chest, fractured skull, no rehab, no memory. Two months later, I woke up for my son’s first birthday. 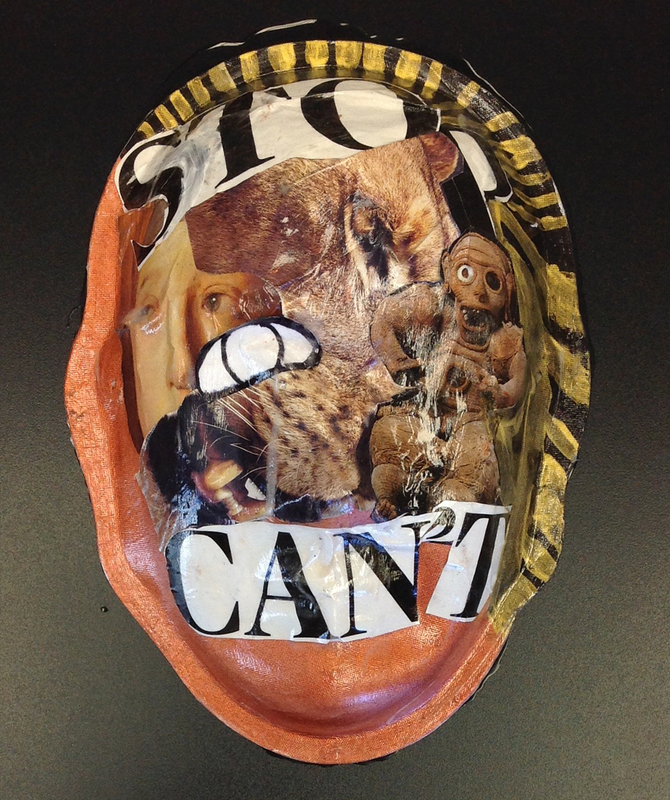 Explanation of Mask: Positive and fearful, my mask contains blindness and seeing, and thinking. I am tired and I have to stop but I can’t. I am optimistic even with all of my battles, I move on. I won’t stop. 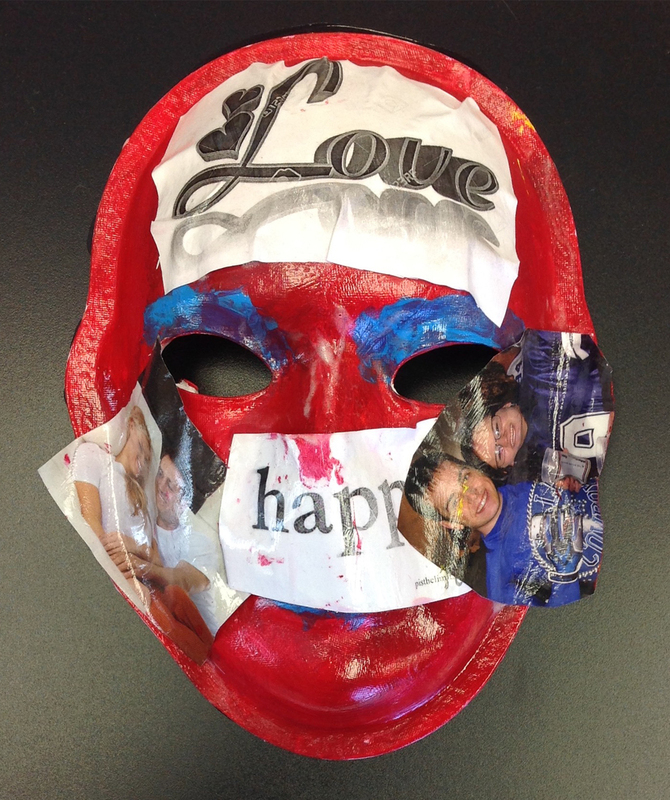 Explanation of Mask: My mask say happy and has a picture of friends to represent how I feel. I have love to represent my love for friends and family. Red is my favorite color. 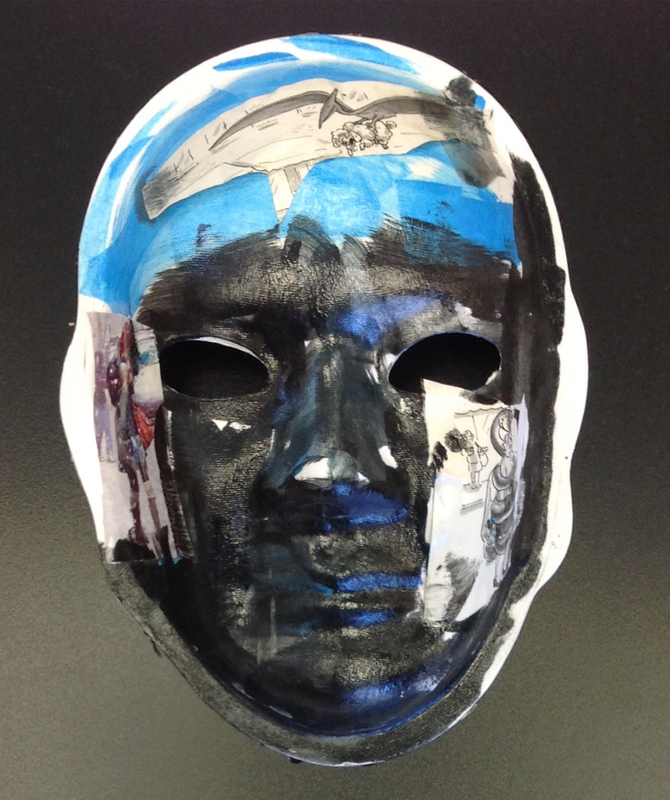 Explanation of Mask: My blue on the bottom is water – emotions that you can drown in with self-pity. Photography looks into your eye because you have to let people into your head – your personal story is no longer personal. 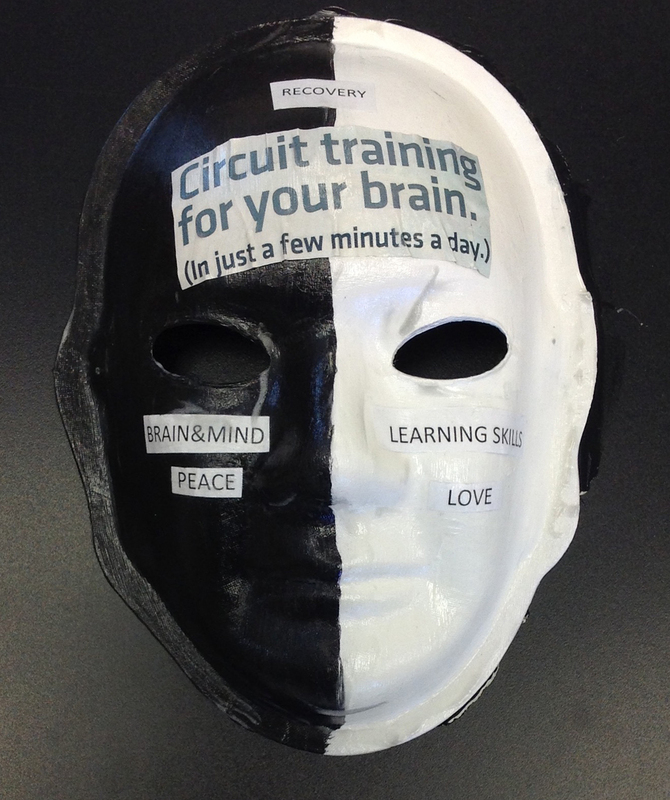 Circuits represent broken memory and processing that is hard to see but is still there. Fan shows how easy it is to be overheated trying to process thoughts and get frustrated a lot. Mouth has glitter to honor how hard it is to tell your story, but the topic you are always teaching others about how a brain injury has affected you. Hands together symbolize team building as your brain learns to reconnect with itself over time. This is what neuroplasticity means. The hands also represent the importance of connecting with others – especially with others who understand your condition. The acorn is a symbol of the transformation as it must die to itself to become an oak tree. This happens in soil with fertilizer. So the doo-doo that happened to me that altered my life also has transformed me. I can feel sorry that I am very cracked or I can see myself as an oak tree in the making. Brain Injury: A truck driven by a person on a cell phone hit my small car and threw it into the truck ahead of me – so I was hit twice. 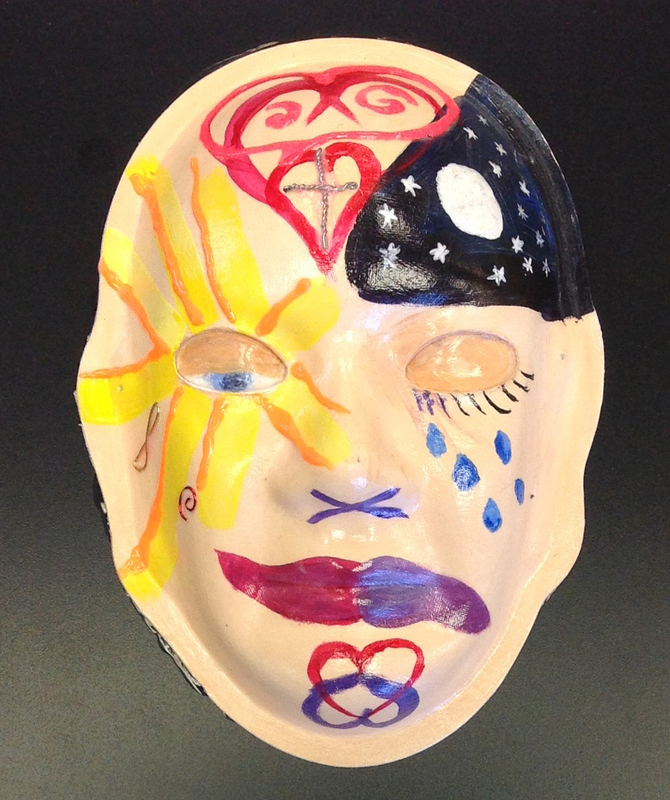 Explanation of Mask: I wanted to be a whole person when I grew up (matured). Someone uncaring took all my hard work of becoming “my beautiful me.” I am damaged inside and it’s dark in there now. Only a few rays of essence still give radiance to my life now. I am so ashamed of my disability and my PTSD effects. I wish I could tell my legs to work right again. I am scared about the eventual path of my life because I do not want to be scared. I try to be serene and peaceful by remembering the radiance and the sparkle that remains. I try to build on that. Seems silly at my age, but I am stubbornly resilient. They should have empathy training for the people that injure other people with reckless driving. 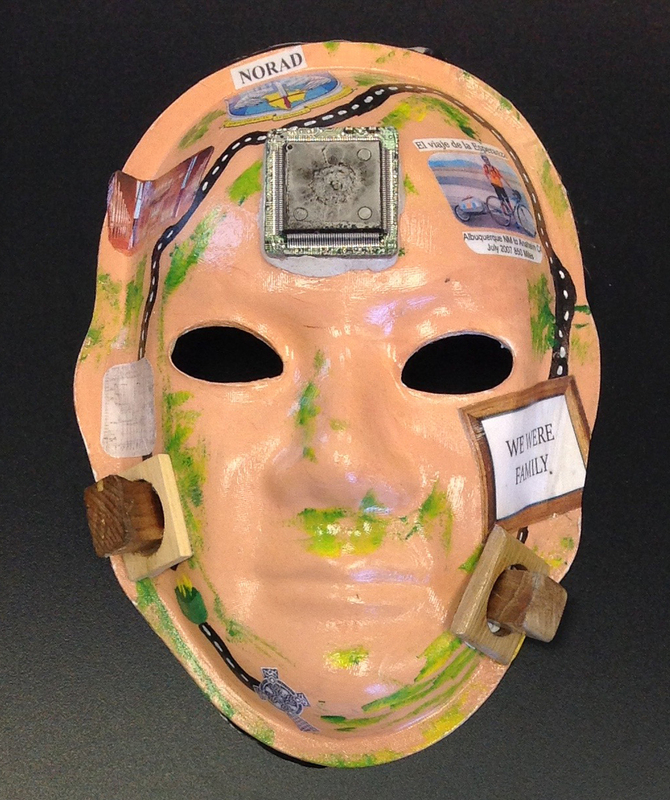 Explanation of Mask: My mask represents coming back from brain injury. By learning how to walk, talk, and live with brain injury. I am also a speaker for the American Stroke Association. The red is for a female standup comedian, who wears sunglasses because of light sensitivity. The left hemisphere is split down the middle from the top of my head to where the good Lord split me. I am a patch work quilt, still putting the pieces together, a work in progress!!! Brain Injury: Post Concussive Syndrome. My brain injury was at the beginning of life. I did not find out about it until October 2005. 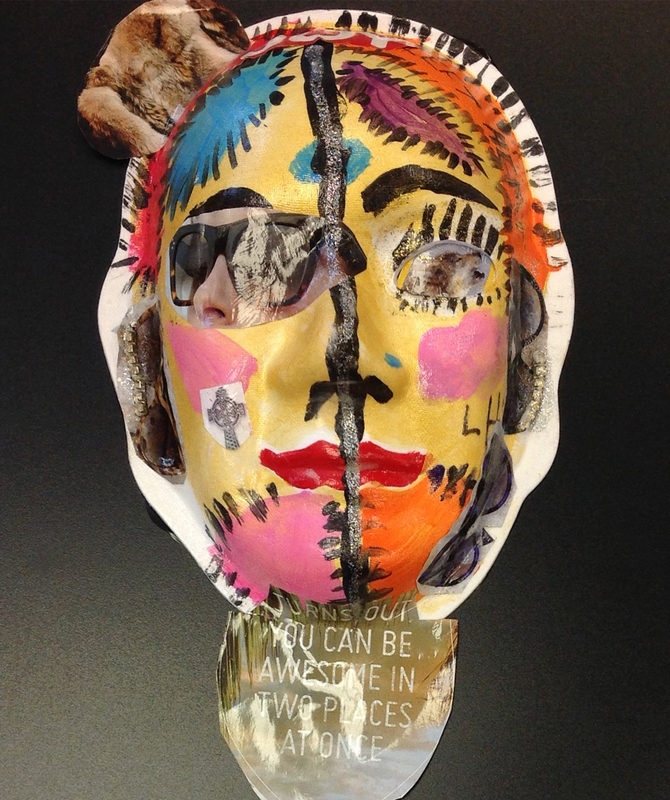 Explanation of Mask: I choose this picture for the simple fact that it is the person that I did not know. It is the only true thing that I know. There is no before or after. The emotion and the true feelings that I feel are love, appreciated, confident, enlightened, joyous, loving, playful, overwhelmed, vivacious, happy, and free. I was an unfortunate, tragic, innocent victim. Brain Injury: My two car accidents in 1978 and 1980. I was untreated for a long time and did not know that I had a brain injury. 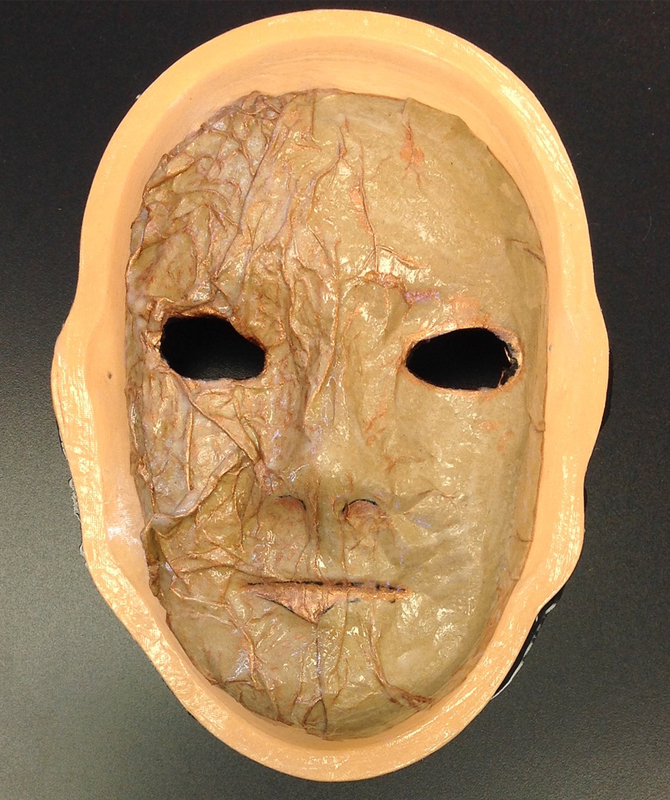 Explanation of Mask: The left side (when looking at it) of the mask explains what happened. The middle is the retraining the brain and the body. The right side explains who I am and what I believe. The gold means light. 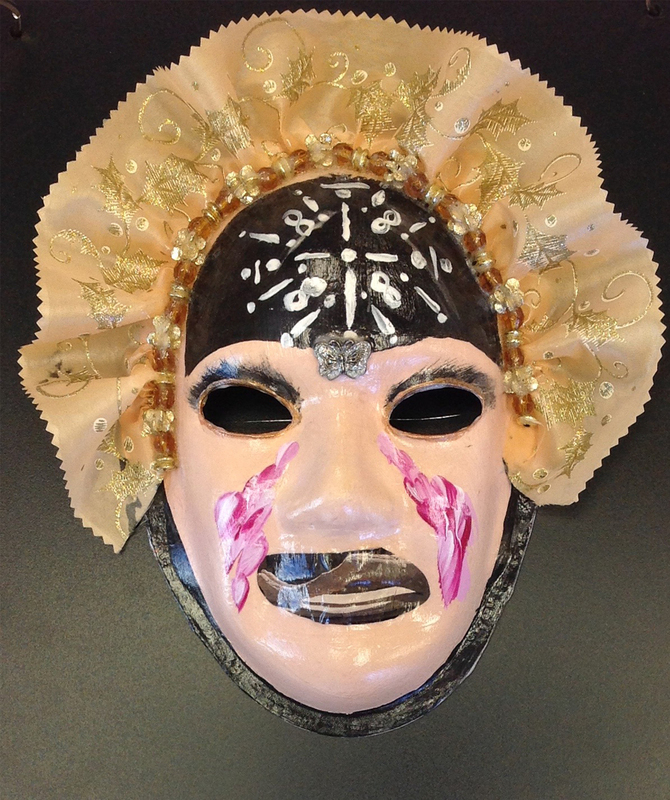 Explanation of Mask: My mask is a reflection of what I see when I look in a mirror. I wonder what happened? Who am I? Where am I? When did it happen? Why did this happen to me? 🙁 I sit in my room and cry and try to learn how to be the new me. Brain Injury: I got hit by a car as a pedestrian. 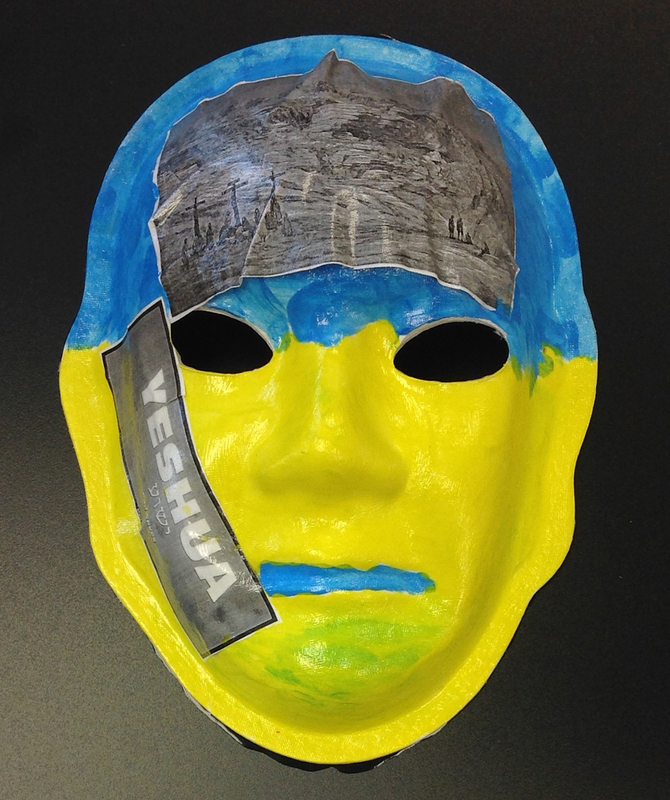 Explanation of Mask: I have a picture of Golgotha – this is where Jesus was crucified. This represents Jesus dying for everyone. The blue is for loyalty to Jesus. The Yeshua God saves us. I have faith in God to get me through the hard times due to my brain injury. Yellow represents my favorite color. Brain Injury: My traffic lane had come to a stop as the on ramp was backed up. I suffered a concussion when I was rear-ended. The velocity was such that both trucks were totaled. 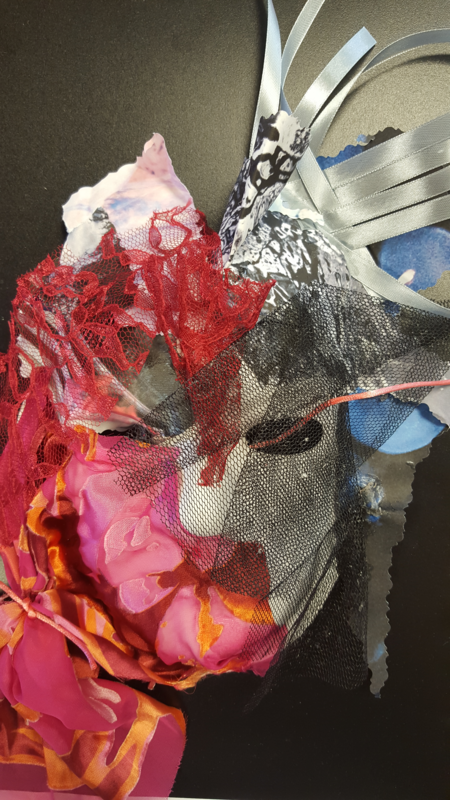 Explanation of Mask: I still feel that my skull is misshaped, my head feels distorted and my mind is fragmented. I sit staring and thinking nothing and then I find myself crying. I am otherwise optimistic and joyous. Sometimes I am subjected to anxiety attacks and wake up from a sound sleep feeling terror and disoriented. Sometimes I get so heavy and weary that I crawl into bed and pass out into sleep. Brain Injury: Multiple injuries starting at birth with the tongs used to squeeze his head. 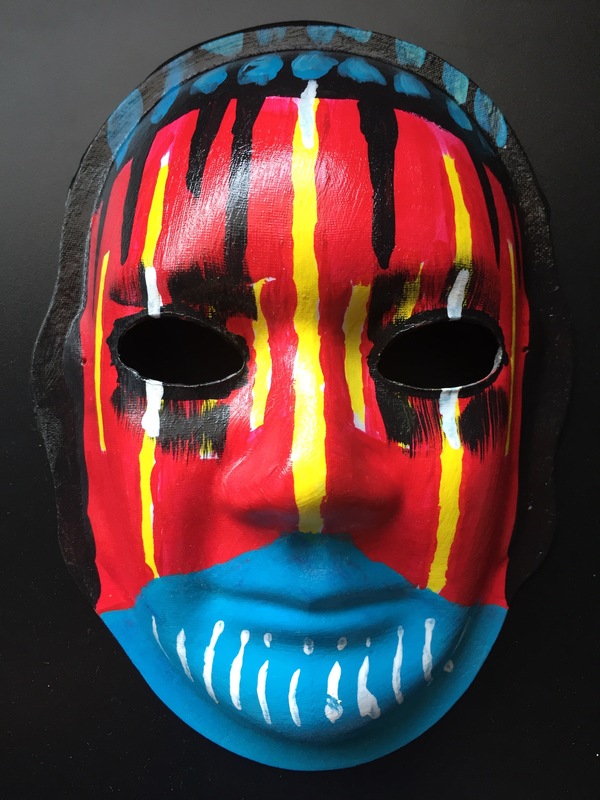 Explanation of Mask: This mask was created by friends that loved Damon dearly. He passed away on 12/26/2015. 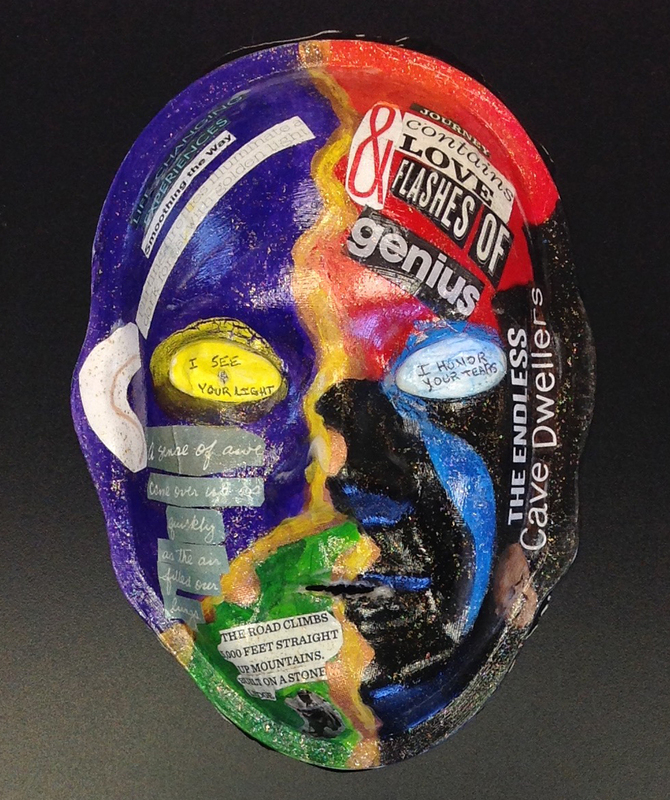 He was a mentor to all in the Brain Injury Community and was a very talented artist. 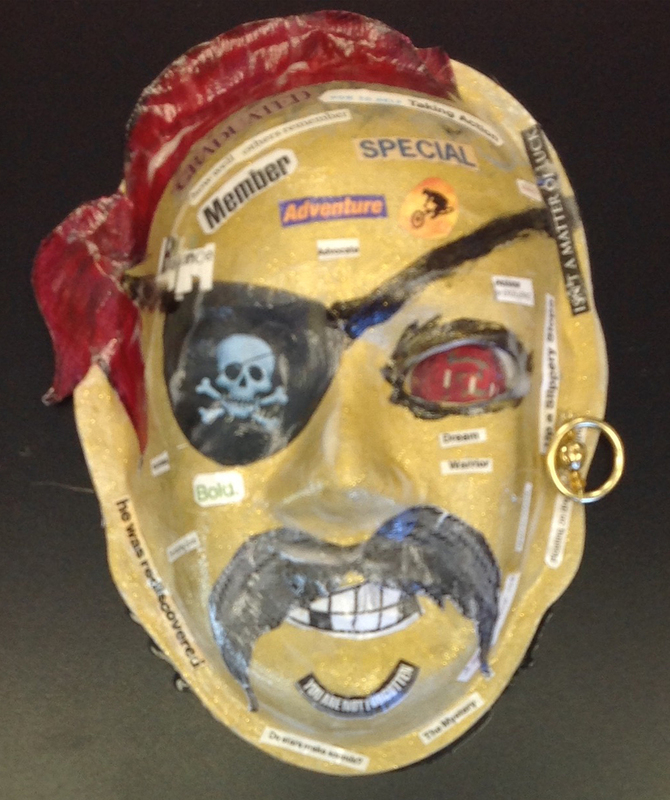 His mask is a pirate as he did a pirate skit that was very funny and had a pirate character that he would immerse himself into. The eye is a picture of one of his great works of art. A red marble. He created the most beautiful marbles and glass pieces. They each had a unique meaning and that they each were created out of love. 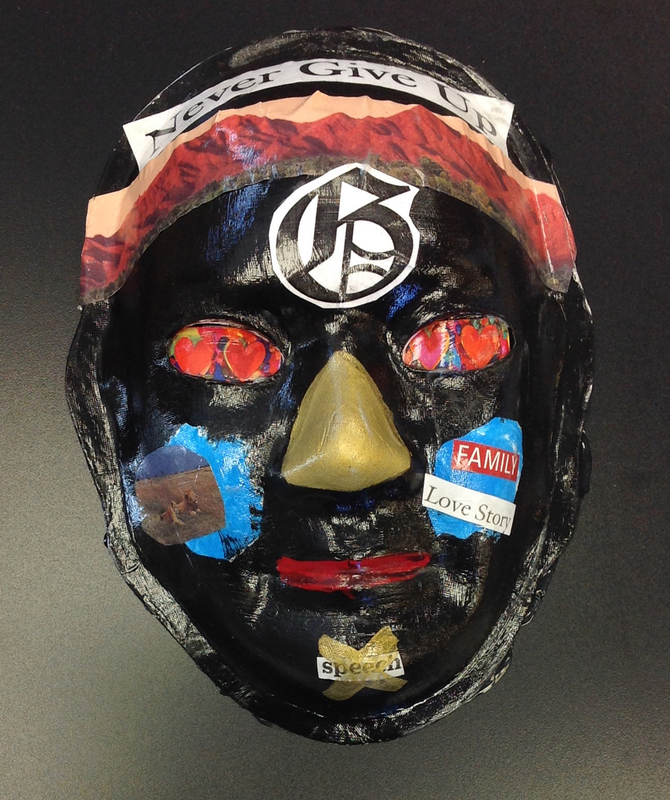 The words on his mask represent words that his friends and loved ones would think of when they remember Damon. 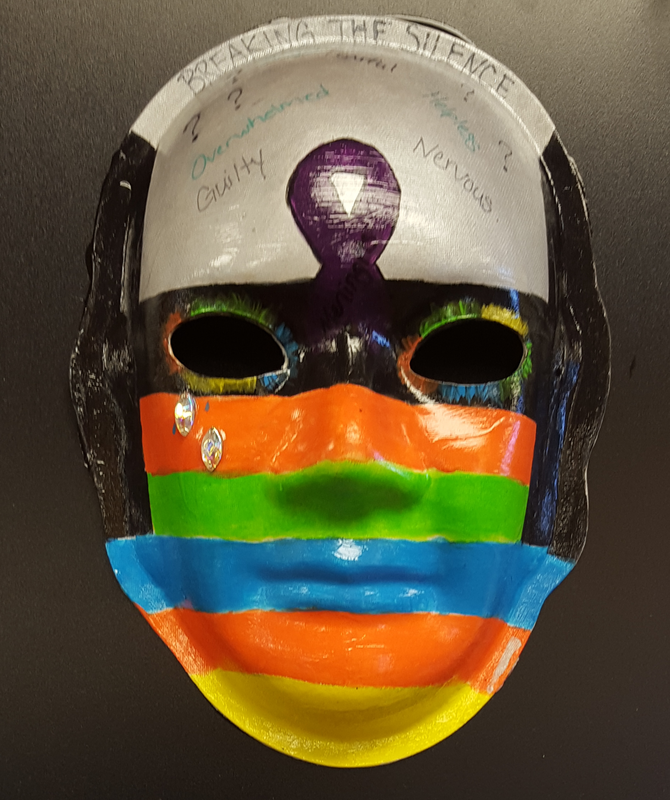 Lastly, ” you are not forgotten” is on the mask as an important member of the brain injury support group, and community. Brain Injury: TBI, after fall on my fanny & my spinal cord acted like a pogo stick & pushed my brain stem in into my cerebellum. Explanation of Mask: I really don’t know. It is a confusing world I am used to. I have no words for not being myself, but in some ways a more beautiful, peaceful person, even with all my quirks. Made all my old pre- TBI problems seem silly. Brain Injury: Forceps were used during my birth, causing a traumatic brain injury. It has been a life-time of disabilities with epilepsy, mental and cognitive struggles, speech impediment, deafness, vision problems, and social problems. 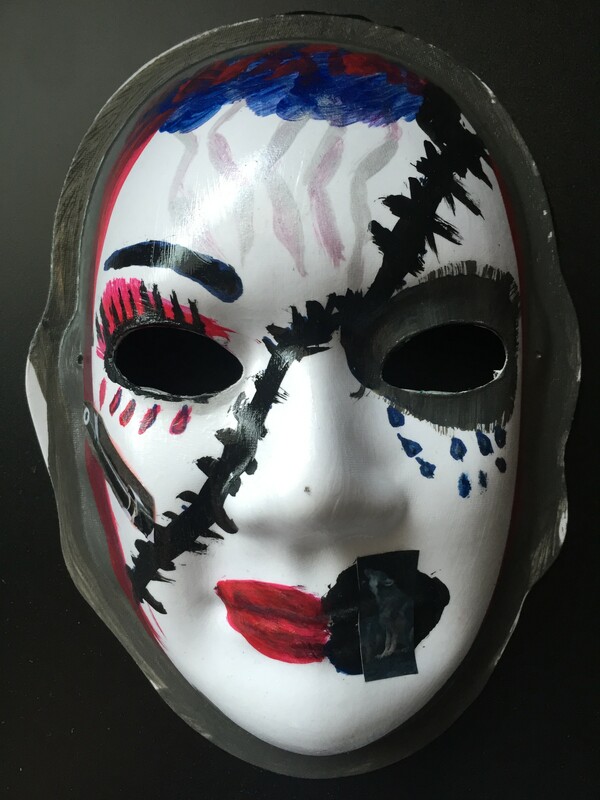 Explanation of Mask: My seizure disorder has been life-long. The brain shows electrical discharges every time I experience a seizure. I have had numerous EEG’s to determine where in the brain the seizures come from. I have to take 3-4 anti-seizure medications all the time. I have to look at the clock for the time to take pills. I am happy not having seizures. I get dizzy every time I fall because I have bad balance problems. I cannot go down stairs without falling down. Due to my brain injury, I have had cataract eye surgery and I am partially deaf. I have been in the hospital several times for all kinds of medical problems and I now have cancer. I have to see doctors, hospitals, clinics, labs, pharmacies, dentists all my life. I have always had a speech problem. Lots of therapy has not helped. When I have fallen I have had concussion on the back of my head. Also, I have fallen on my chin. I have had stiches three times on my chin and the back of my head. However, I am happy and grateful to my mom for a life time of love, care, and devotion for all my medical problems. She has always been supportive and I couldn’t cope with all my problems without her. Explanation of Mask: There was a dark deception of life where your eyes open to the glory that hope, faith are roads to happiness. Brain Injury: TBI November 22, 2014. Innocent victim of violence. 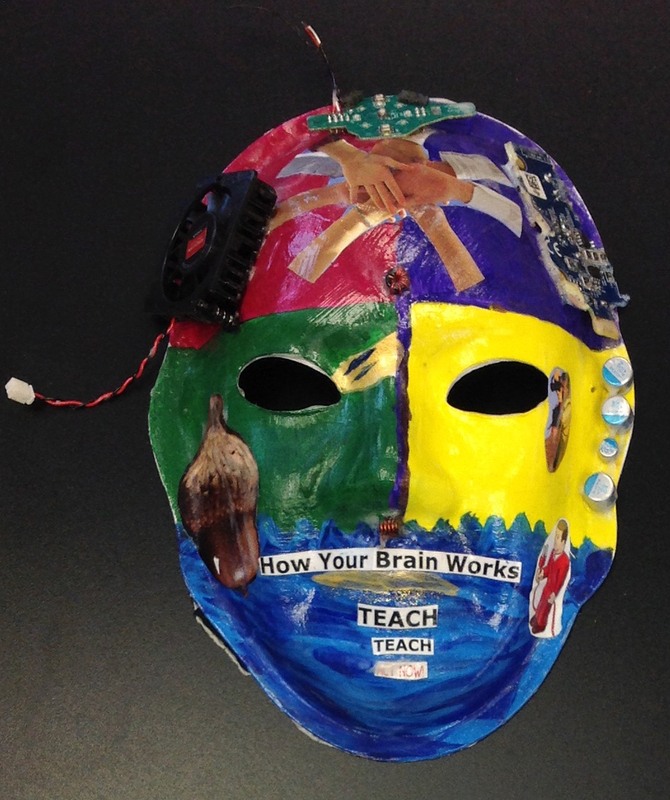 Explanation of Mask: Learning about TBI disability and awareness of what happens in one’s head. Scientific evidence does suggest that we can change our brains by training our minds. Brain Injury: Stroke on June 25, 2009. 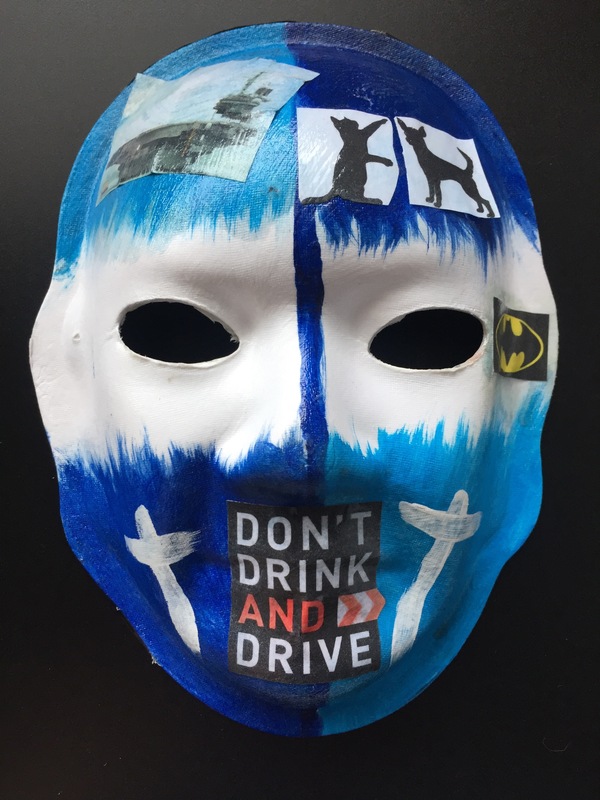 Explanation of Mask: Driving was a favorite job of mine. I ballooned to over 300 lbs. 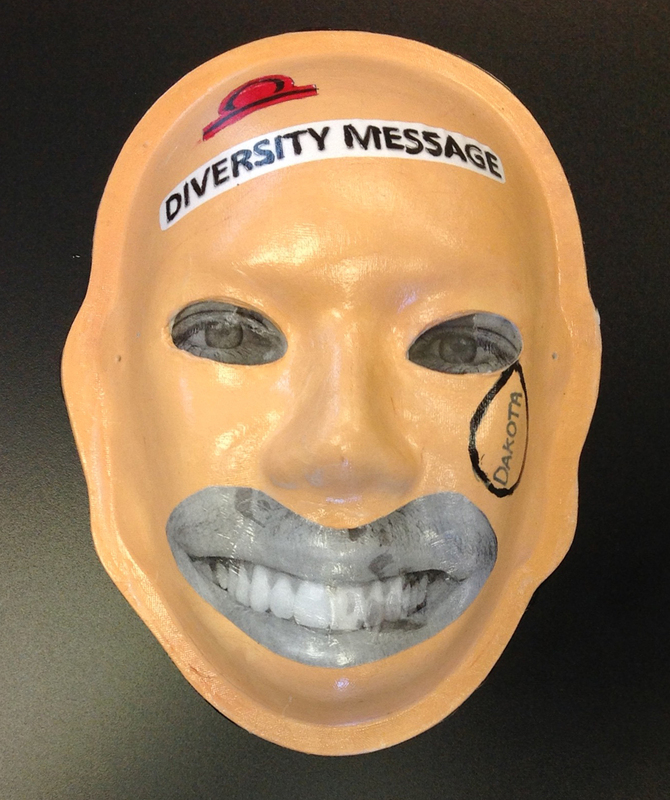 Part of the mask honors my friend, Damon. I had no memory for about two months. I remember waking up in a nursing home. I panicked and tried to escape. 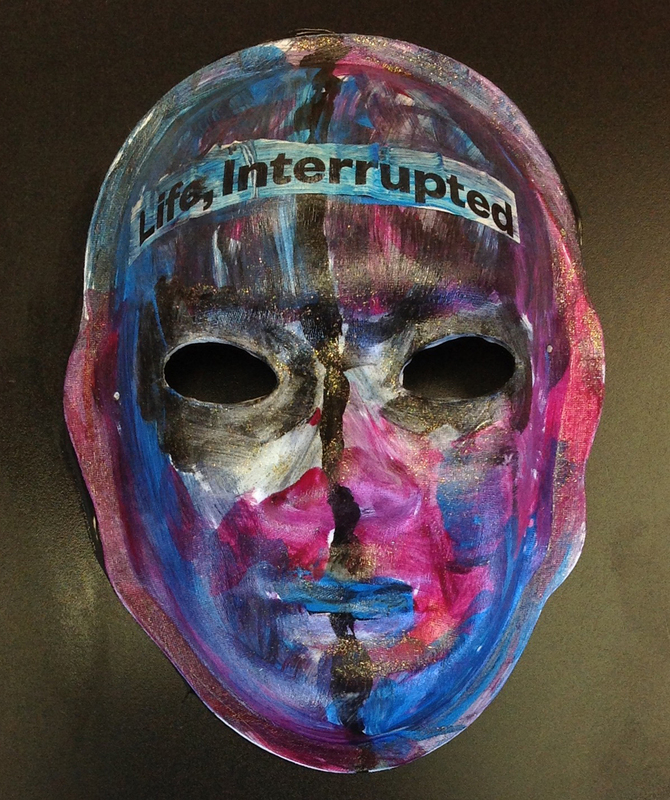 Explanation of Mask: “Life interrupted: A half life” represents the old Travis and the new Travis. The multicolors are the emotional thoughts within a conversation. The gold specks represent goodness and happy thoughts that I see and when I speak as a person with a TBI. Brain Injury: TBI when I was assaulted in a home invasion. I just remember fighting back and I would have been killed if I was not such a big guy. I was unconscious for a few days. 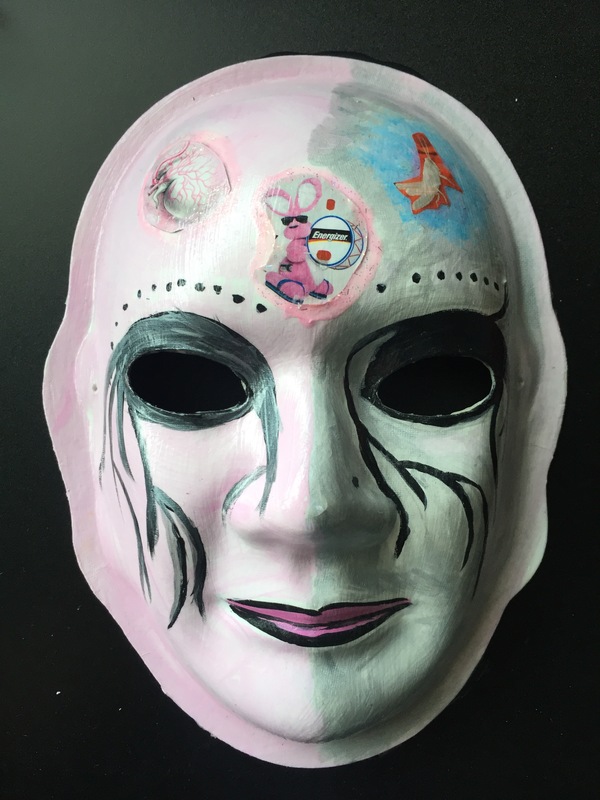 Explanation of Mask: My mask represents what I actually saw when I looked in the mirror. I was hurt, and one side of my face looked different than the other side. 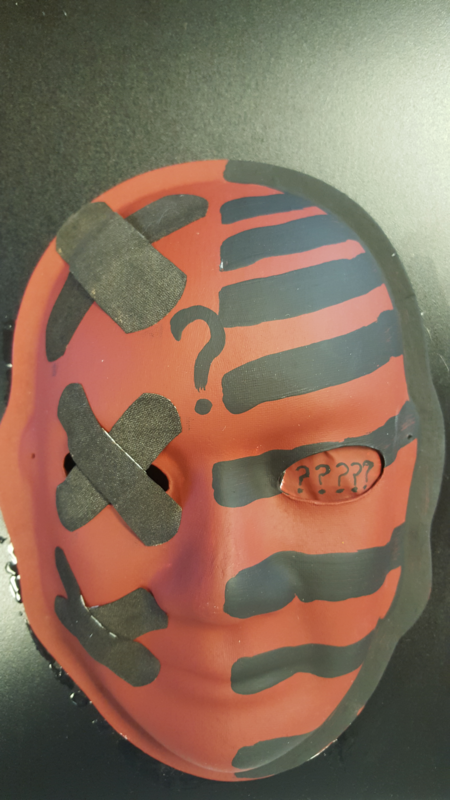 I have this thing where I am confused all the time (like the questions mark on my mask). At first I did not understand or know what was wrong with me – I was just confused. I am hurt on one side, and I am different on the other side. The mask shows that I am also confused. 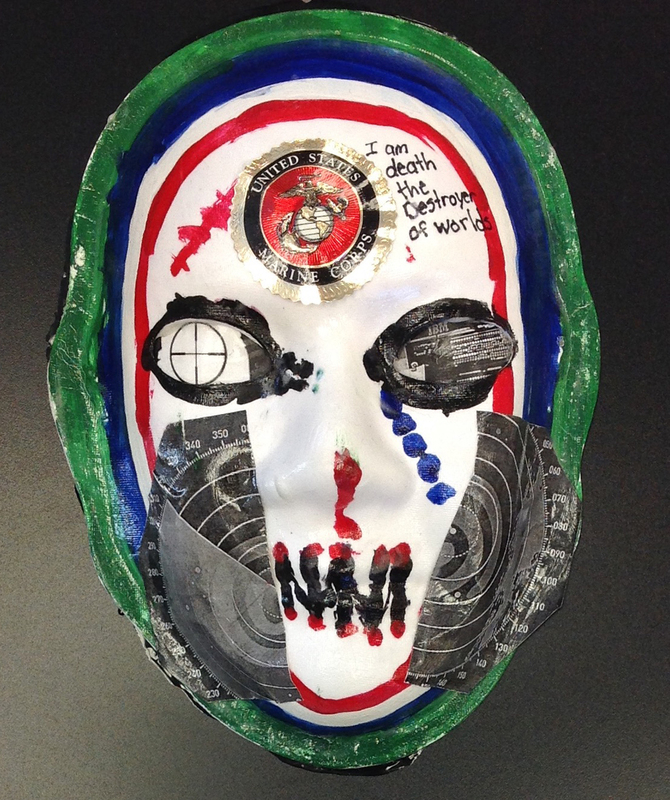 Explanation of Mask: This mask is decorated on behalf of a survivor. Every year it got worse, and we adjusted and worked hard — mentally and physically — to make it better. We went through trials and treatments and felt that it was a long, stressful journey, but we handled it as a learning experience. Stephen was a genius and still is, though he is a different person now. He used to love classical music and played instruments; now, he cannot stand loud noise. He has his ups and downs, but support gets him through it. He keeps busy at home reading and studying the Torah, which helps him cope with life. Stephen says that he will never give up, even on his bad days. He witnesses online to help others in desperate need. He is a warrior to the Lord Jesus Christ. 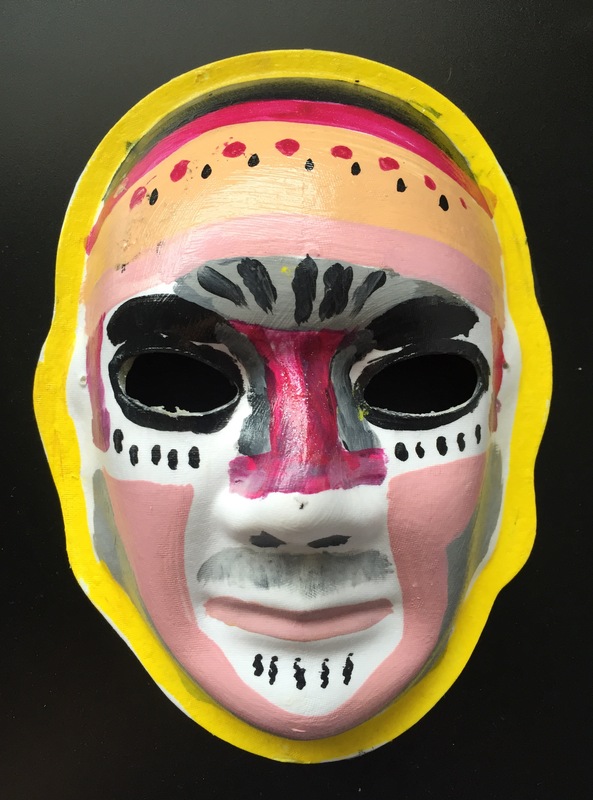 Explanation of Mask: My mask, “Forever Young,” is a reflection of my culture and likes. The color red represents anger, orange represent hope, and yellow represents calmness. I’m fascinated with making pottery, collecting Jordan shoes, and I’m a diehard Miami Heat fan. Mickey Mouse represents me. My family is a strong support system. I want to glow from the inside out! Explanation of Mask: Lily is a gorgeous girl. She is the Queen of our family, but she is also a tomboy, a prankster, and a musician, and she loves technology. Therefore, her crown is trimmed with pictures of a sports car, a woman playing the drums in a rock bank, a circuit board, and a boat in a dock in the ocean. 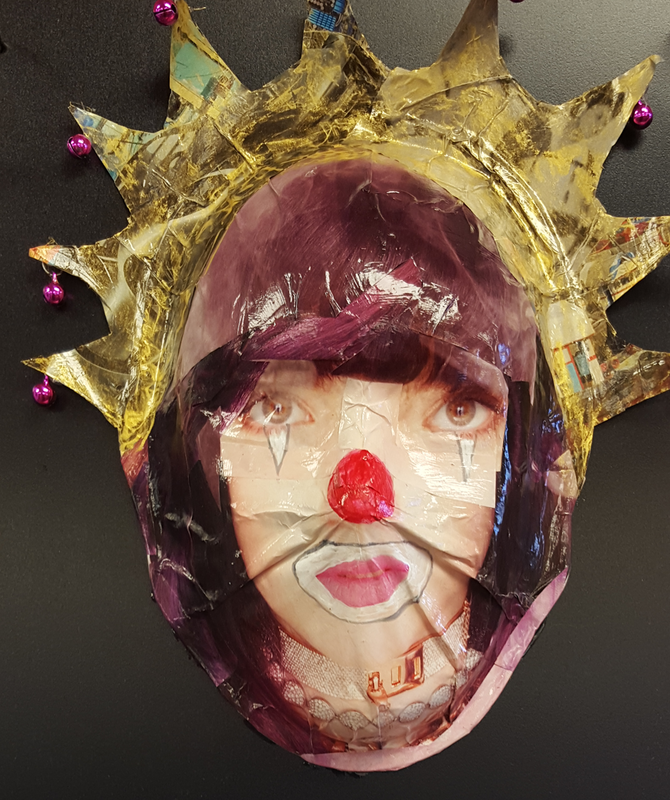 The crown is trimmed with bells that sparkle and sing, and she has clown make-up. Silly Lily, Queen of our world. 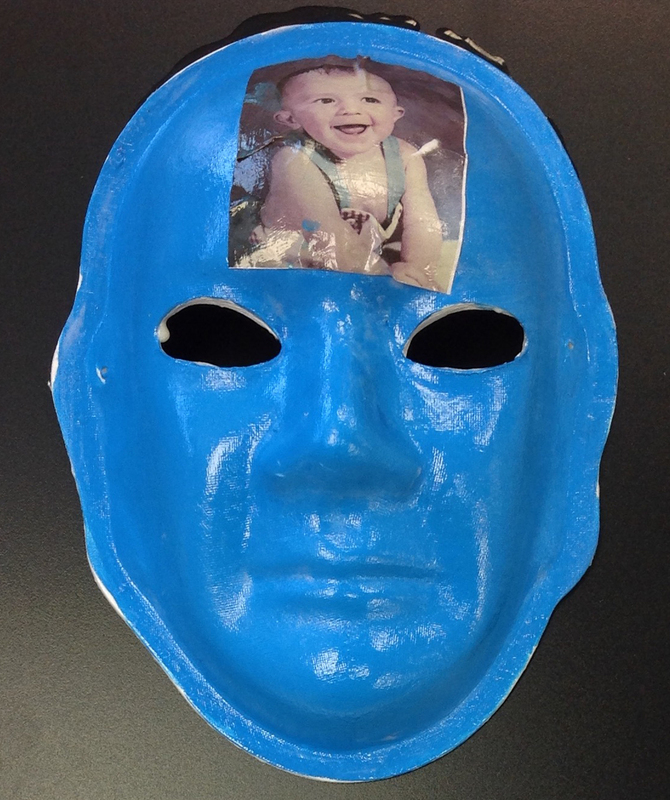 Explanation of Mask: Osmar was diagnosed with bacterial meningitis at 22 months. At 23 months, he became profoundly deaf. At first, I was in denial, scared and hopeless. Today, I feel proud of him for how far he has come, and how many barriers he has overcome. I am hopeful and positive about his future. The bright colors represent my efforts to keep positive after his diagnosis. The colors around the eyes symbolize his bright future. The dark represents the silence without his cochlear implants. Brain Injury: Traumatic Brain Injury due to being violently shake at age 2. I am now 25. I cannot walk, talk, or see well. Explanation of Mask: My brain has two dimensions. One part is confused, mixed up, and explosive. The largest part is bright and colorful. People say that I have bright and beautiful eyes that I “see” others through. My wish is that the brightness can overcome the explosive part. 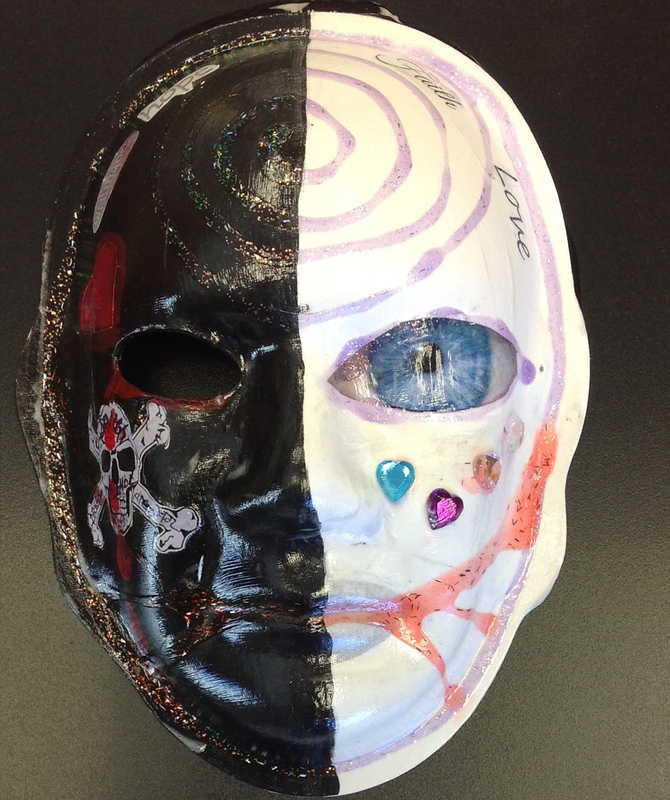 Explanation of Mask: The mask represents how I often feel on most days. Some days are black and some days are white. The picture represents how confused I feel and how I feel that I am unable to see. The orange represents my clarity and how my faith in my traditional teachings keeps me going. 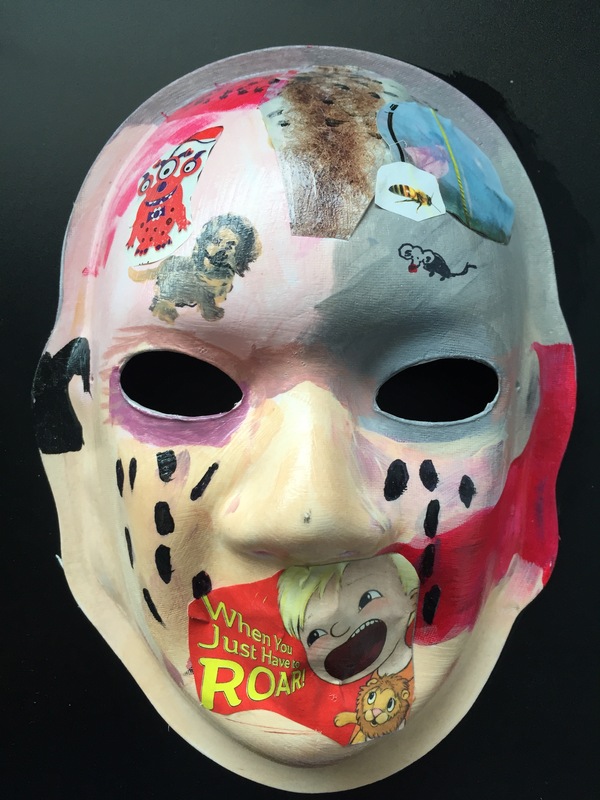 Explanation of Mask: The title of my mask is “Alive, Horrified, Hopeless and Helpless.” Yes I am alive but always living in the past. I constantly think horrific memories of my brain injury. I can’t help feeling helpless and hopeless. 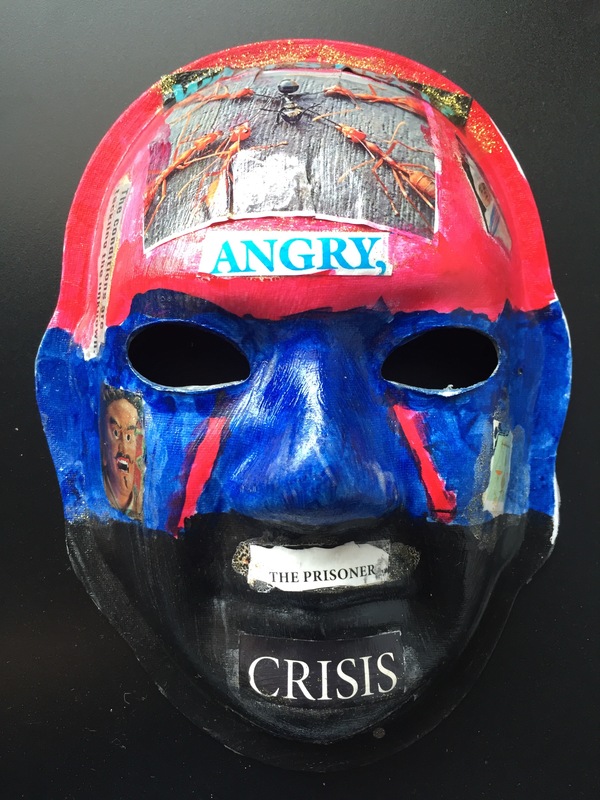 Explanation of Mask: Anger is what I feel all day with a lot of confusion. I feel hatred and loneliness. I have too much going on in my head. I live a fight everyday with life and don’t want to get up in the morning. 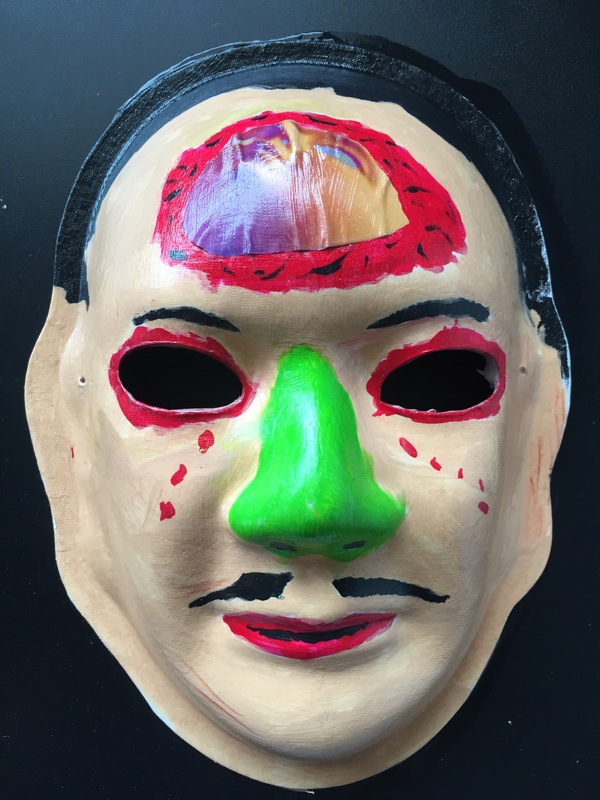 Explanation of Mask: I can remember things that happened a long time ago, but my memory of recent things is really bad. I cannot remember things such as when I go somewhere, I do not remember the way back. I feel like my mind is going “blank.” There is hurt in my eyes. 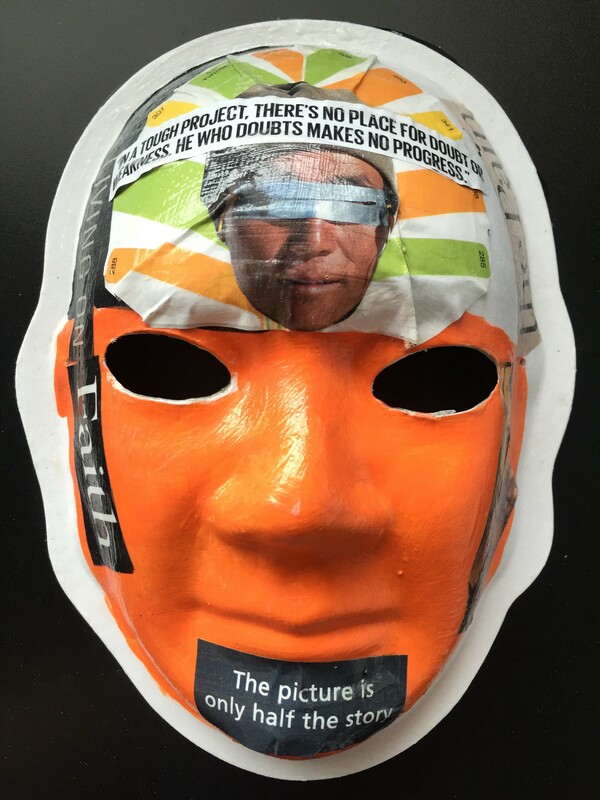 Explanation of Mask: I am a proud U.S. Veteran. I have served in the Far East. Things that matter to me are Batman and my pets (our kids). Losing loved ones to an idiot drunk driver. Love life and live it to the fullest. Appreciate all who surround you. They are there for a reason. Brain Injury: Traumatic Brain Injury. On December 31 1976 at 3:00 am I ran head first into a parked car while on a snowmobile. I sustained a complete skull fracture, broken jaw below the left side of my chin, and rammed my right jaw bone into my right ear canal. 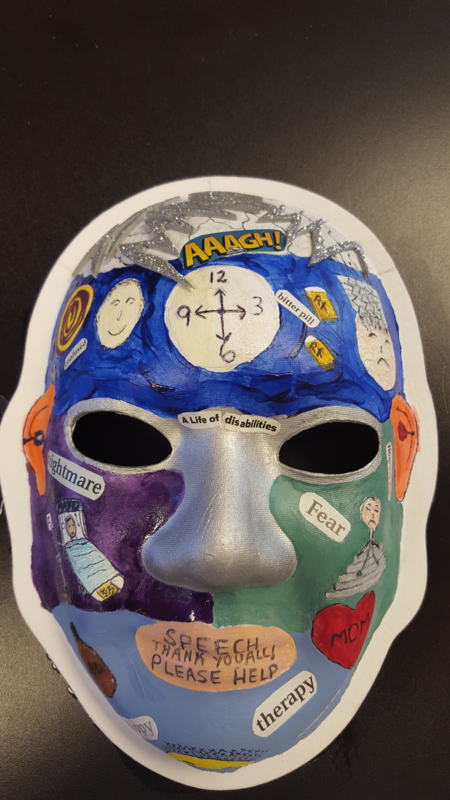 Explanation of Mask: My mask represents all the emotions I have gone through over the last 39 years of my life recovering from my brain injury. The money represents all the wages and productivity I have lost during the first ten years of my brain injury. Since my BI I have found that, unfortunately, services are lacking in NM and all over the US. Brain Injury advocates like myself are working hard to change that. State Representatives like Debra Armstrong (NM) are currently working on legislation to have insurance companies pay for rehabilitation services desperately needed by people with BI to help rebuild their shattered lives. It is important to be able to pay for long term BI rehabilitation we need to be successful in re-entering society and becoming productive members of our communities. Life after BI is difficult but not impossible. 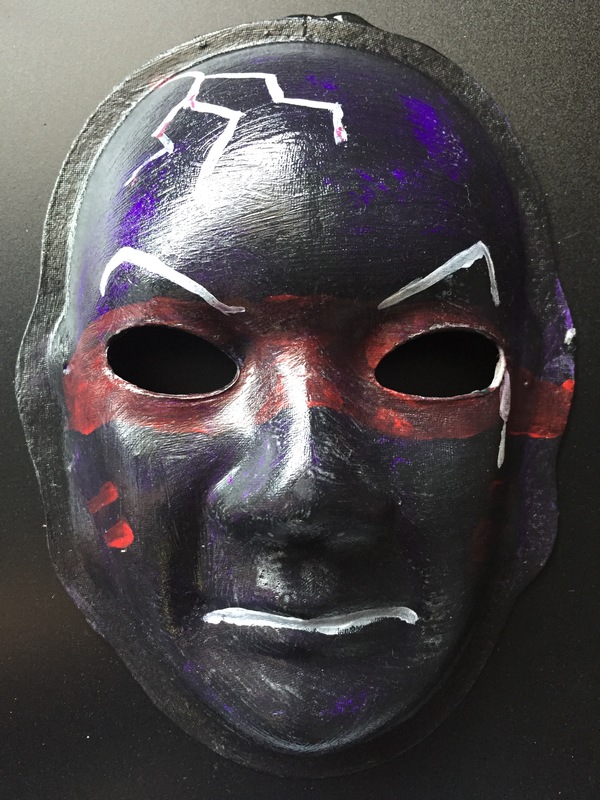 Explanation of Mask: The top of my mask is black and red. Black being the dark and the red is an enemy within. Tan is the color of my skin. I am stumbling around in life. The grey and black eyes show that the brain injury is bringing me down. Black eyes I can’t see out of, I can’t accomplish what I want. The bottom of the eyes show that I feel like I am being struck down. The nose shows that because of brain injury senses like smell are gone. The moustache shows that I am unable to do everyday things like shave. The yellow represents light-all things left behind. 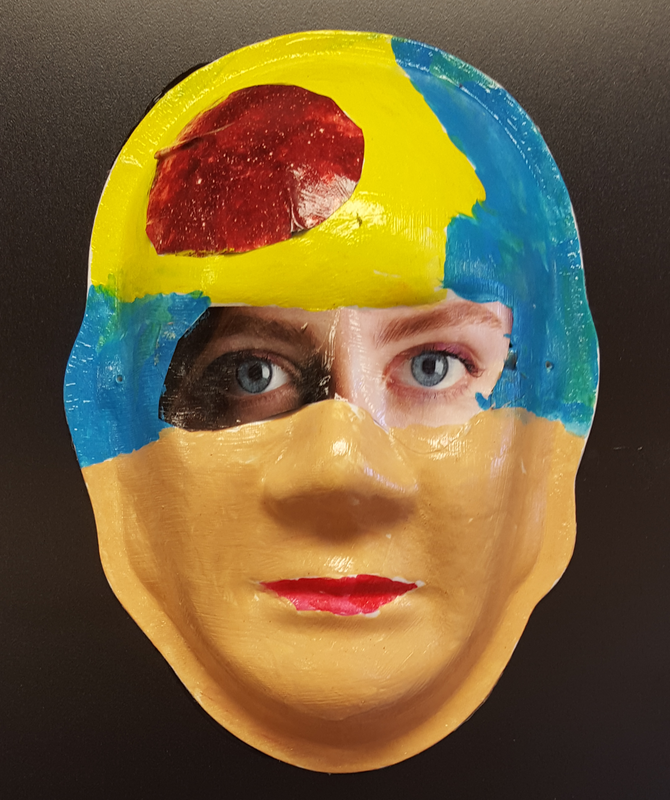 Explanation of Mask: The red area of my mask is where my brain injury is. The yellow is where my nose was injured and my lip skinned. I also lost half of one ear. 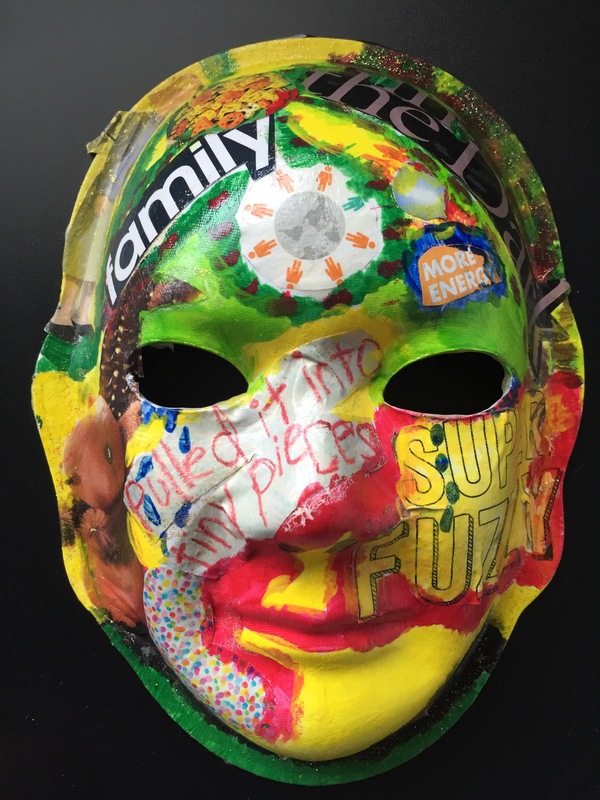 Explanation of Mask: Family support is the greatest value in living with a person with TBI. Learning and understanding are important to help loved ones go to the next level of acceptance of an illness that is not present to the eye. 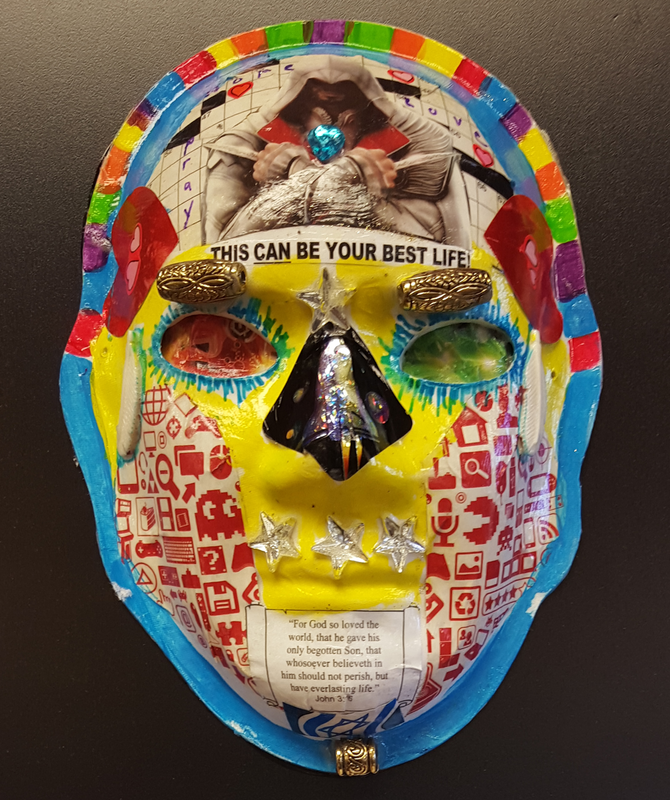 Explanation of Mask: The title of my mask is “My Life Outlook.” The stars on my mask represent the “Northern Cheyenne Morning Star Tribe” of which I am a part of. 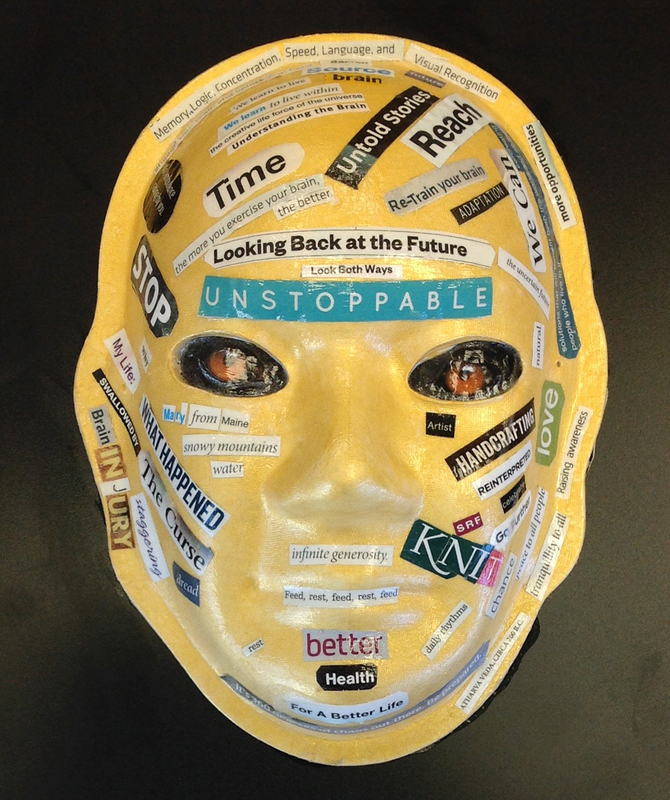 All of the words carefully written on my mask are a representation of my outlook on life since my brain injury. Brain Injury: Riding my motorcycle near home I tried to avoid a dog in the road but was not able to. I was not wearing a helmet and my head hit the ground. 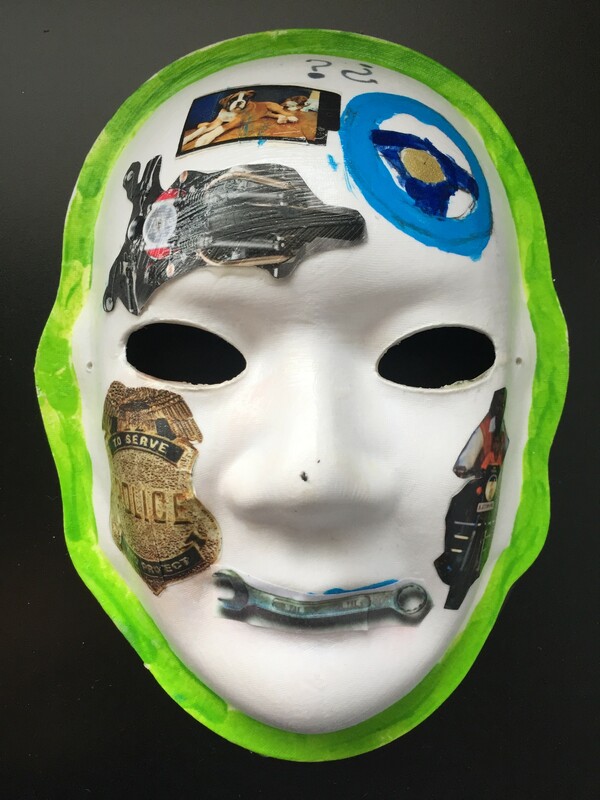 Explanation of Mask: My mask shows I am able to drive a car, but not my motorcycle. The steering wheels shows my ability to drive and my driver’s license. My ability to drive is very important to me. My job is also very important to me so that I have the ability to support my kids. My frustration is when I cannot prove to others I can. Brain Injury: Traumatic Brain Injury, October 31, 2010, from a fall. 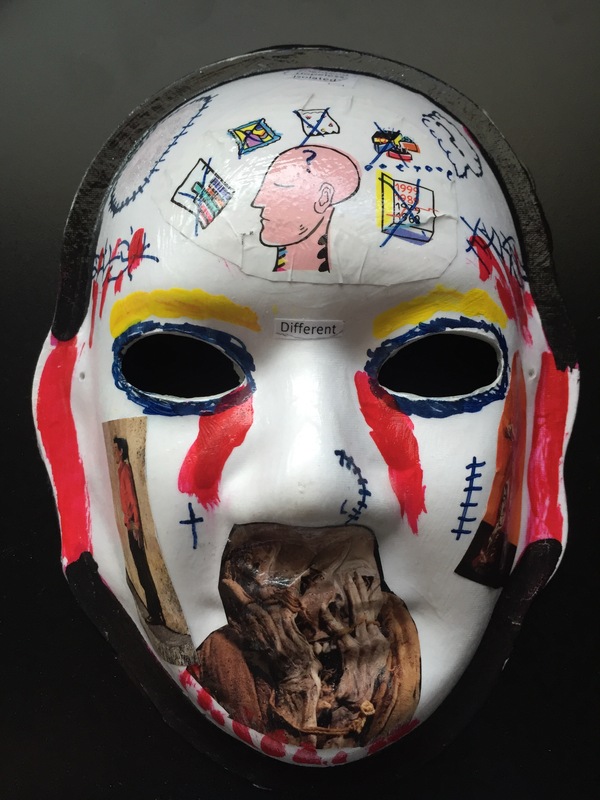 Explanation of Mask: Red paint on the head and the red tears represent the pain I feel in my head everyday. Blue represents me feeling so blue all the time. 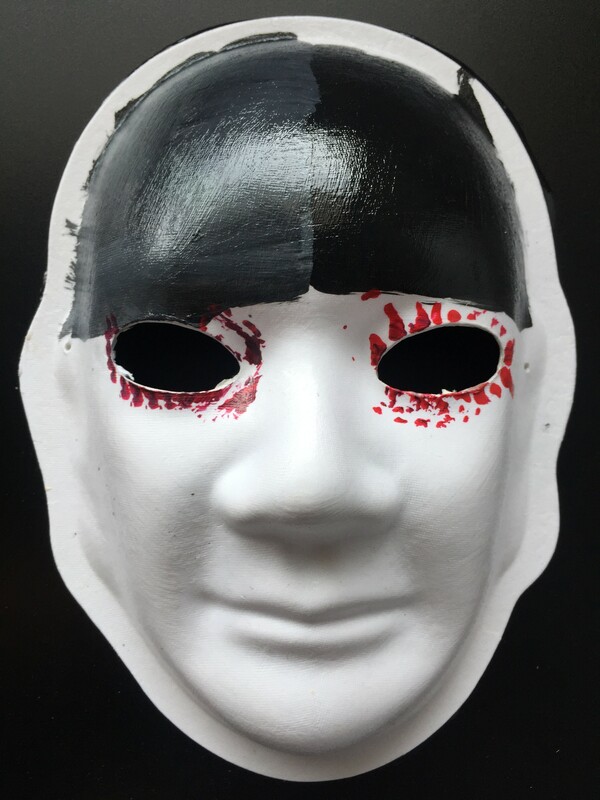 The color black on my mask represents me, hiding from myself. The black ant being torn up by red ants represents me feeling like my brain is being torn apart. Brain Injury: Traumatic Brain Injury, 2010 auto accident. Skull fracture, my right ear was ripped off. I spent 3 months at the Brain and Spine Center and underwent extensive physical therapy, speech therapy, and occupational therapy. 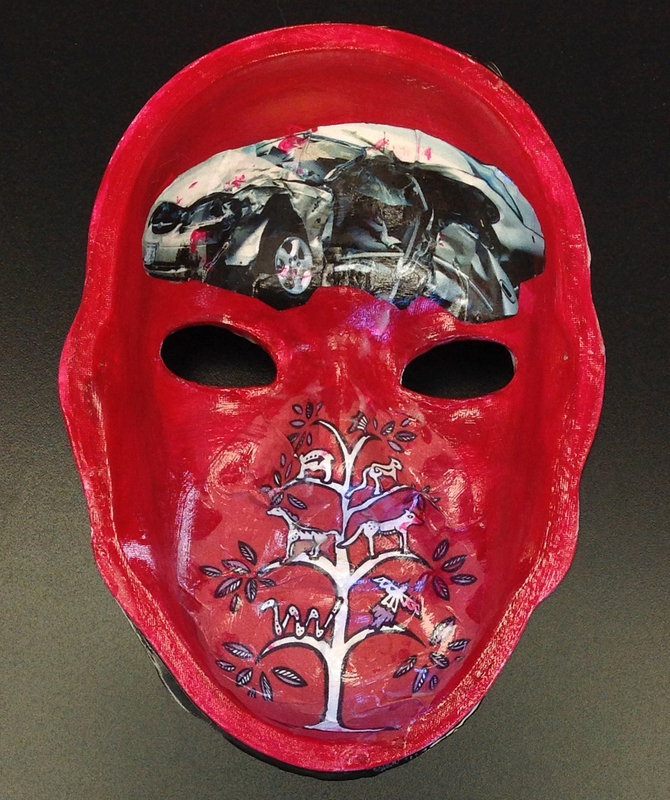 Explanation of Mask: The ants on the head of the mask represent the crawling and itching where my skull was cracked during my injury. When my head works, I feel like a lion, strong and capable. Often my mind is fussy or just empty and I can’t think right or focus. I hear loud sounds like a siren in my head that makes me want to hide like a scared mouse. When in a crowd of people I feel like I am in a bubble, I feel like I can’t breathe or find my confidence, it gets hot and all I want to do is cry or crawl under a table and hide from the world. Sometimes I get angry because I drop things. It feels like I can’t control my hands or my legs. A loud noise or a fast movement can trigger anger and fear which makes me cry. If under a fluorescent light for too long it will bring me to my knees. I feel very different and feel frustrated because I am not always in control and that is an understatement. Some challenges are a blessing to me, that’s how I am able to cope. I will keep facing my challenges head on, it is a reason to be me. Brain Injury: Driving down the interstate, a rock from another car came in my truck and hit me in the face. This made me lose 60% of the blood in my body and killed me 3 times. 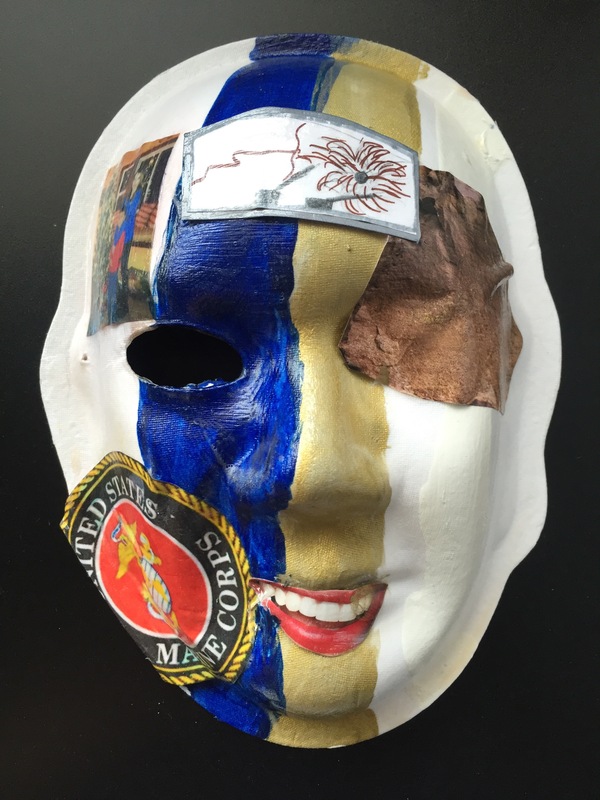 Explanation of Mask: I was a Marine for four years. I am very proud of being a Marine. Before my accident, I got married to my beautiful wife Paulette. We have two wonderful kids, Nadia and Ray Jr. My family was going on vacation to San Antonio. Five miles from the Texas border, a rock crashed through the windshield right into my left eye and cheek. I died three times in the emergency room. My family means everything to me. Since my accident I have changed into the happiest person on the earth. 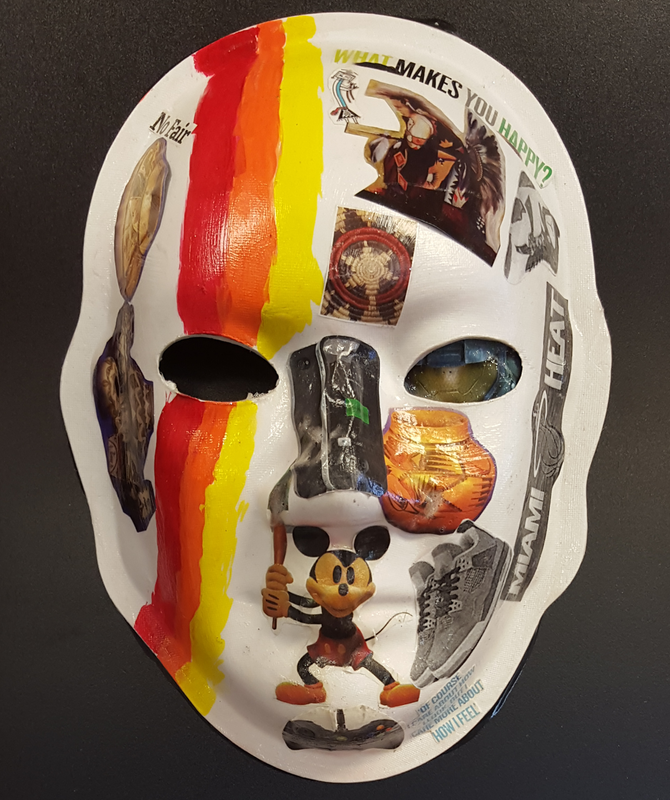 Explanation of Mask: The title of my mask is “The Hidden Pain.” The red color in my mask represents my proud Native American heritage. The black and grey colors represent the pain I am feeling. The dark colors represent the anger and loss of hope that I am experiencing. Brain Injury: As a child I fell and hit my head, I also have been in two car accidents and hit the right side of my head. Explanation of Mask: The right side of my mask with the grasshopper (white) represents how I am seen as busy- jumping from one project to the next. The energizer rabbit represents always busy and cannot sit still. The left side of the brain shows the pain I get when I have a bad headache. They gray sides show my feelings on being alone wearing a goth mask. The pink side is how I want people to see me as happy. I continue to stay confident, courageous, empowered and focused. I have completed my master’s degree in social work so that I can help advocate for other people seeking help. Brain Injury: Tumors and concussion from almost being beaten to death. 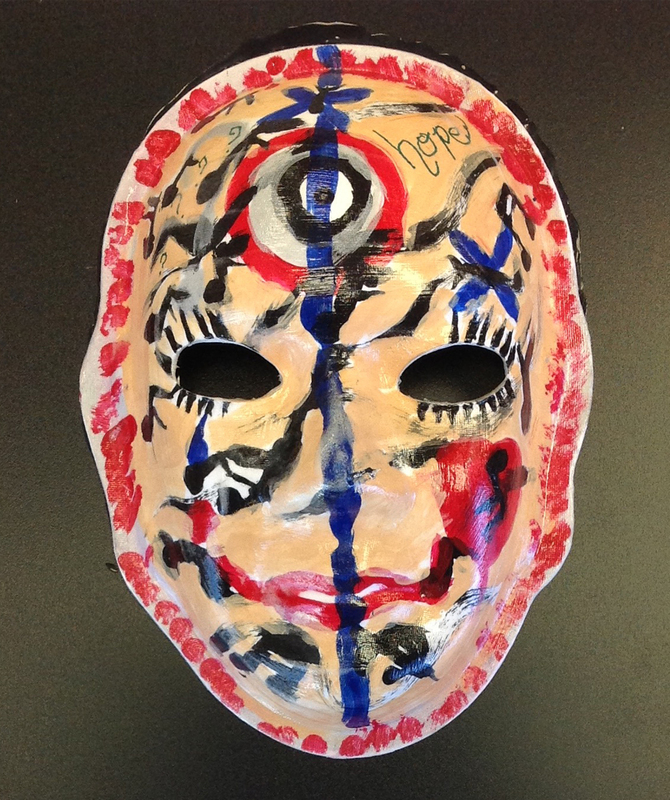 Explanation of Mask: I am a survivor of violent crime. When I was 18 years old, two men broke into my apartment and beat me with a knife and gun and kicked me with steel toe boots to the head. I get really bad cluster headaches. I have short term memory loss. I have attempted suicide three times due to my pain. I became a drug addict to deal with my pain. I also suffer from anger problems, depression, I have to take painkillers, and I am on oxygen. Brain Injury: How many is too many? Concussions in the Corps, attacks and fights. 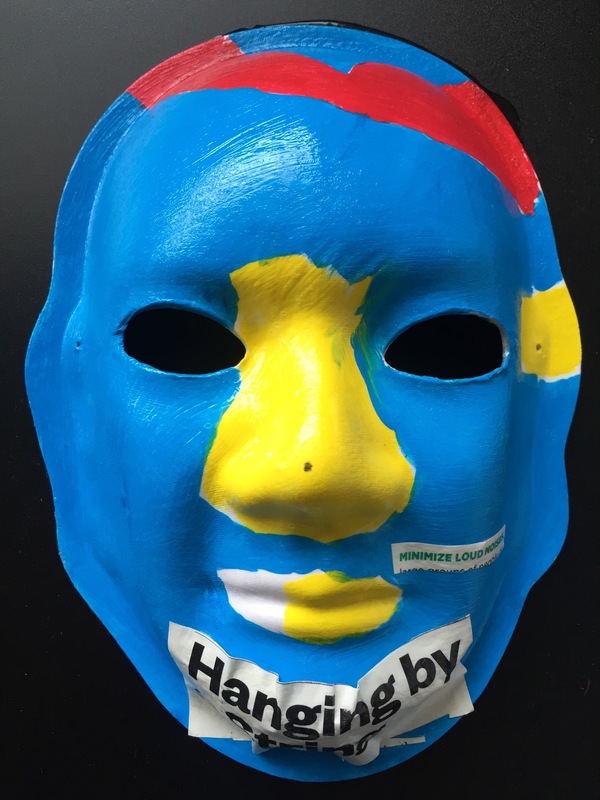 Explanation of Mask: I have had to stay strong. No one was there to say “poor thing.” I have excelled in some areas because I have had to. The other areas I feel so out of control and want to scream every day. I have to have the attitude of a bear. The weapon is a sign of attack. The lightning on the forehead is for the headaches I have had every day for years. The makeup is how I have to be seen. The black scar is how I feel all the time. There is blood all over and black all over, but to succeed is what has to be done. Simple. Brain Injury: Military veteran- in preparation for deployment I had a parachute malfunction. I had a second TBI from a blast explosion. A 500 lb bomb dropped close to our position while tunnels around us were collapsing. 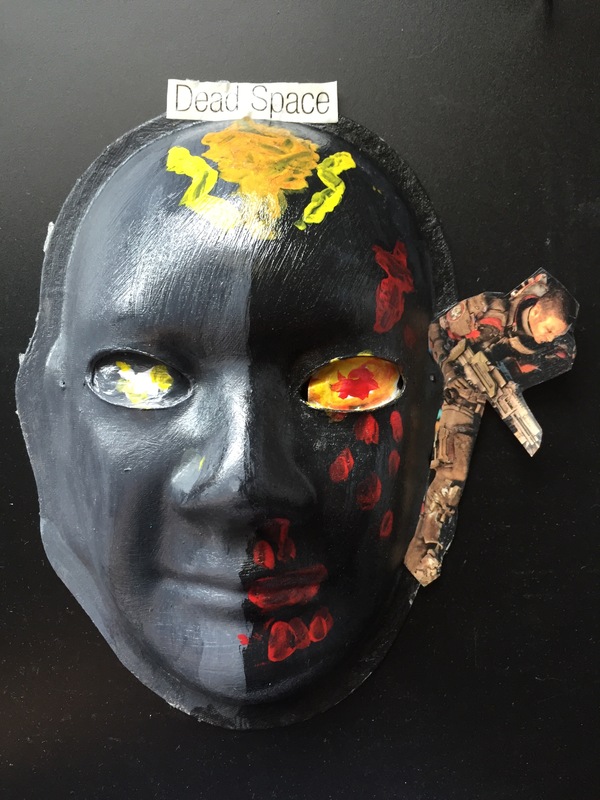 Explanation of Mask: There is severe pain throughout my brain with sharp pain running all over my head. I cannot see, I cannot hear. Sunlight hurts. The only time I feel good is for a short time after I get shots in the back of my head where the spinal cord connects to the brain to relieve severe pain. I want to say good things, good words, good songs, but the pain won’t let me. All I ask is to think and speak from turquoise mountains. The pain stops me day and night. The anger, hate, depression, and isolation that you feel makes you want to die just to find peace. Brain Injury: Subdural Hematoma (Age 22) with subsequent cranioplasty. Post driver fell and hit me on the head (Age 48). 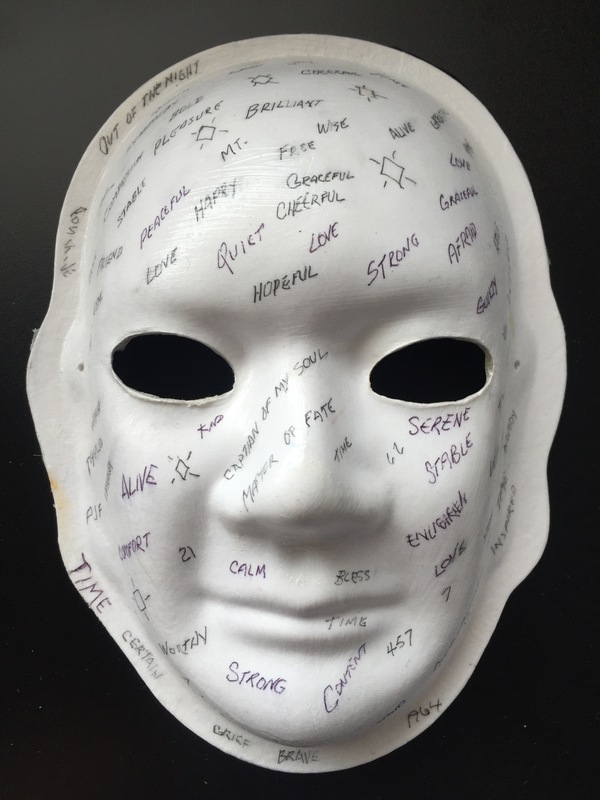 Explanation of Mask: I feel scared and completely confused most of the time. The scars are from past injuries. Knowledge and education can be lost with a brain injury. The crown of thorns represents the pain I carry around every day. I have severe short-term memory loss as shown by the question marks. They eyes crying tears of blood are of painful memories. The man in the body suit is a bubble excluding me from everything (solitary). The skeleton represents that I am afraid to die like this. The man standing on a cliff shows my fear of jumping into the unknown, but if looked at as if he is lying down, this shows my fear of getting up. The cross means to let go and let God take over.